Business Development Manager is a highpriced asset to the company as they are involved in building and generating new sales to the company. The job role of these managers are to identify sales leads, pitch goods and services to new clients and fulfil all other roles and responsibilities such as –following up new business opportunities, setting meetings, planning business strategy, executing presentations, communicating to existing customers about new product development, overseeing business development, writing reports, and providing necessary feedback to the management. The candidates applying for this post should have bursting self-confidence, enjoy public speaking and presentations and love networking. It would be an additional asset if the Business Development Manager Resume mentions skills like – good business sense, a thorough understanding of marketing and business management principles and negotiation skills. Employers look for candidates with an education level to the least of GCSE, along with some marketing and sales experience. Headline : To continue my career in the environmental services industry, combining my environmental and business acumen, to be able to provide clients with reasonable, business-smart solutions to their environmental issues. Find potential new customers, present to them and ultimately convert them into clients. Continue to grow business in the future by means of implementing tactics in line with company image. Manage existing clients and ensure they stay satisfied, positive and remain in good standing while promoting growth in sales. Call on clients, make presentations on solutions and services that meet or predict their client's future needs. Plan persuasive approaches and pitches that will convince potential clients to do business with the company. Develop a rapport with new clients, and set targets for the sales team while providing support that will continually improve the relationship. Grow and retain existing accounts by presenting new solutions and services to clients. 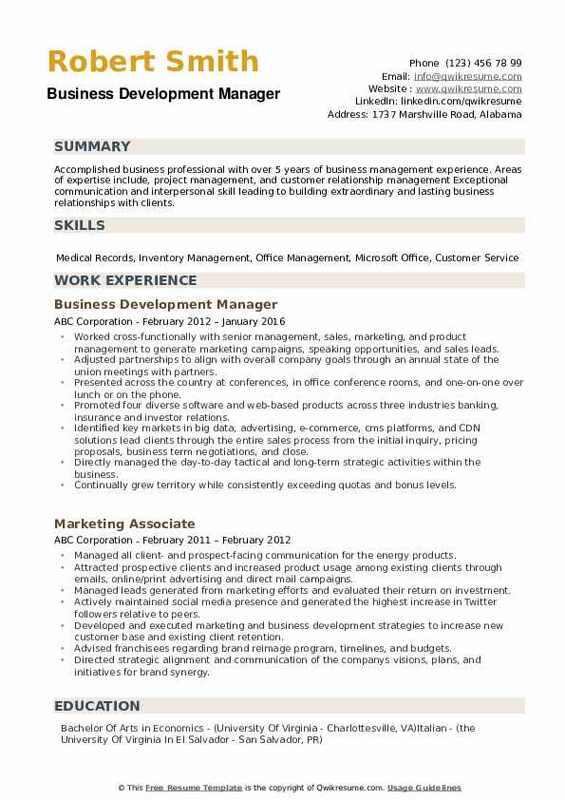 Objective : Positive, business-minded professional looking to leverage my professional marketing/business development experiences and education to aid in market research and strategy. Passionate about, community outreach, market research and consumer insights. Well-versed in research design, data collection methods, data analysis and strategy formation. 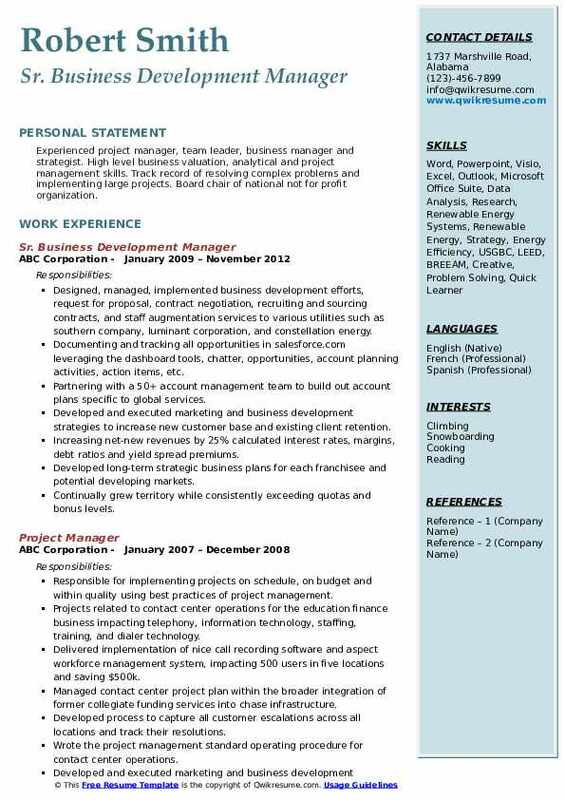 Skills : Business Development, Business Analysis, IOS, Salesforce, Sales, Business Operations, Social Media Marketing, Social Media Management, Management, Customer Service. Meeting potential clients by growing, maintaining, and leveraging network to ensure a robust pipeline of opportunities. Handling objections by clarifying, emphasizing agreements and working through differences to a positive conclusion. Ensure that data is accurately entered and managed within the company's sales management system. Train, mentor, and shadow sales team members, including appointment setting, outbound cold calling, prospecting and negotiating sales contracts with new and existing accounts. Managed all vendor relationships, lead pipeline and direct marketing sales campaigns. 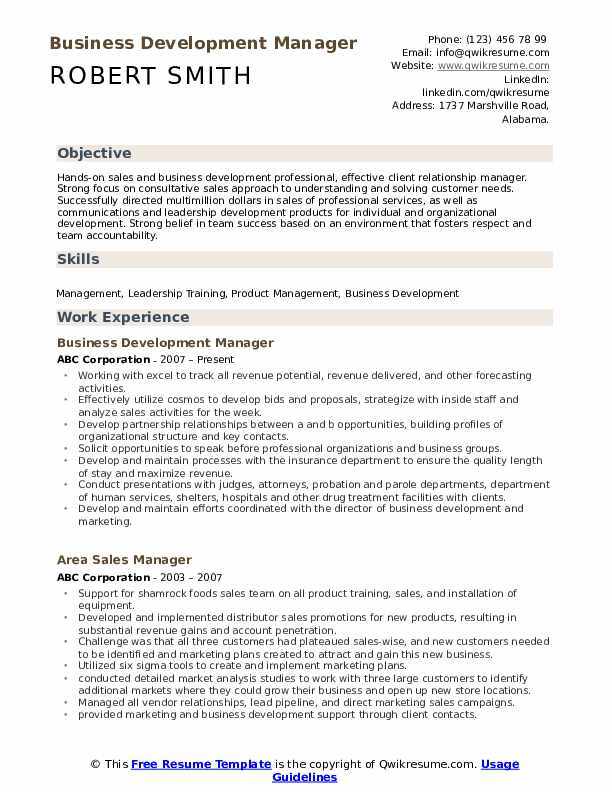 Summary : To attain a Sales Management position using expertise in Window Treatment Sales/Marketing Management, increasing sales and creating effective programs that contribute to higher organizational profits and market share. Maintain membership records through the database; updates member records; compiles and prepares reports and presentations including research as needed. 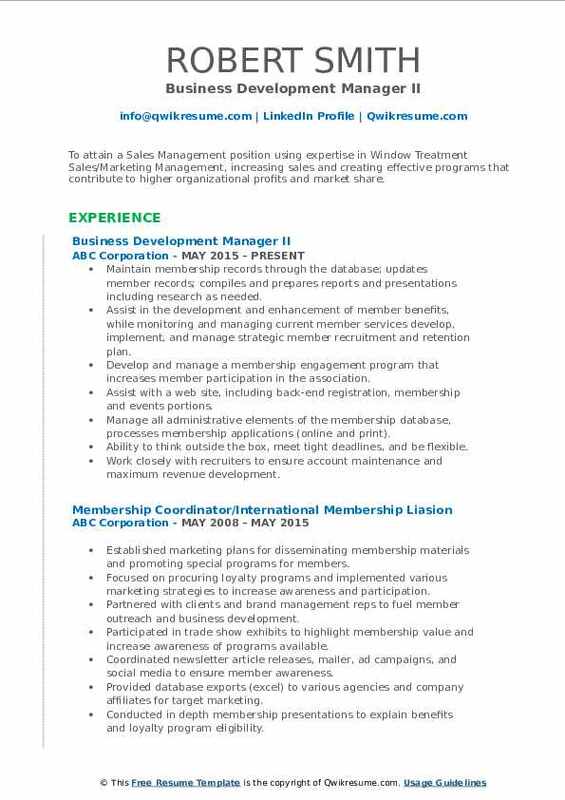 Assist in the development and enhancement of member benefits, while monitoring and managing current member services develop, implement, and manage strategic member recruitment and retention plan. Develop and manage a membership engagement program that increases member participation in the association. Assist with a web site, including back-end registration, membership and events portions. Manage all administrative elements of the membership database, processes membership applications (online and print). Ability to think outside the box, meet tight deadlines, and be flexible. Work closely with recruiters to ensure account maintenance and maximum revenue development. Responsible for new account acquisition, profitability targets, relationship management, cross functional collaboration and promotional activations. Exceeded goals by a minimum of 10% each quarter, outpacing the division each period through customer relationship and targeted sales focuses. 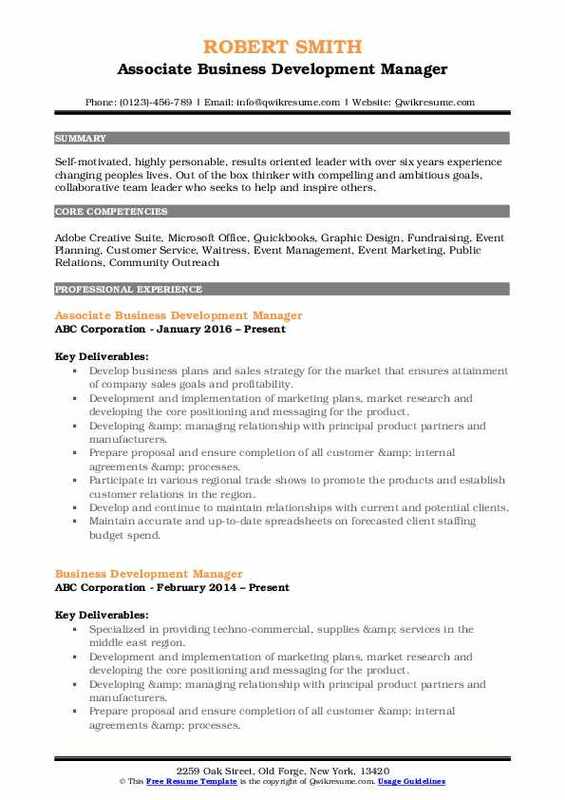 Objective : Experienced project manager, team leader, business manager and strategist. High level business valuation, analytical and project management skills. Track record of resolving complex problems and implementing large projects. Board chair of national not for profit organization. Designed, managed, implemented business development efforts, request for proposal, contract negotiation, recruiting and sourcing contracts, and staff augmentation services to various utilities such as southern company, luminant corporation, and constellation energy. Documenting and tracking all opportunities in salesforce.com leveraging the dashboard tools, chatter, opportunities, account planning activities, action items, etc. Partnering with a 50+ account management team to build out account plans specific to global services. Developed and executed marketing and business development strategies to increase new customer base and existing client retention. Increasing net-new revenues by 25% calculated interest rates, margins, debt ratios and yield spread premiums. Developed long-term strategic business plans for each franchisee and potential developing markets. Continually grew territory while consistently exceeding quotas and bonus levels. Responsible for all aspects of the development, concept, and copy for the company website and all company literature. Summary : Highly Accomplished business professional with diverse experience poised to transition solid background in Business and Administrative assistance and client services. Offer outstanding team leadership, communication skills, behavioral management and conflict resolution skills. Research and expand the suite of services, focused on technology and customer experience improvement. Research hardware and software technologies for disaster recovery enhancement projects to include virtualization, secure storage solutions, and encryption. Manage vendors for infrastructure installations of mobile bank units including delivery, construction, water, sewage, electrical, and communications. Manage to make or buy decisions regarding a fleet of mobile banking equipment; optimizing delivery methods and leasing from partners and vendors. Coordinate inbound and outbound logistics, conducting an inventory of equipment, diagnostic testing of hardware, maintenance of mobile bank fleet and satellites. Develop in-house services, network servers, and enhancements to office infrastructure. Identified the opportunity for selling encrypted storage devices for transporting network virtual images, reducing the time for encryption processes by 100% and increasing annual sales revenue. Developed new accounts and increased business at existing accounts, focusing on high profile organizations. Headline : Seeking a challenging and rewarding career in a diverse environment where my strong work ethic, education, and expertise can be used to help promote the mission and exceed team goals. Work directly with marketing to discover opportunities from leads, and set appointments from those leads. Use of strong selling and influencing skills to set up qualified appointments. Consistent use of sales approach and techniques based on product or service solutions. Working closely with account executives and attending customer meetings as required. Attend sales meetings, vendor training, local trade shows to keep current with technology. Understanding of workflow systems and their application to customer business process improvement. Key decision maker in developing the company's strategic business plan and annual sales projections. Generated new sales and maintained existing sales accounts through skilled large account management. Developed and implemented focused sales and marketing program of accounts. Objective : Self-motivated, highly personable, results oriented leader with over six years experience changing peoples lives. Out of the box thinker with compelling and ambitious goals, collaborative team leader who seeks to help and inspire others. Develop business plans and sales strategy for the market that ensures attainment of company sales goals and profitability. Development and implementation of marketing plans, market research and developing the core positioning and messaging for the product. Developing & managing relationship with principal product partners and manufacturers. Prepare proposal and ensure completion of all customer & internal agreements & processes. Participate in various regional trade shows to promote the products and establish customer relations in the region. Develop and continue to maintain relationships with current and potential clients. Maintain accurate and up-to-date spreadsheets on forecasted client staffing budget spend. Business development manager reviewed movie pitches and private entertainment endeavors, and identified potential investment and business opportunities. 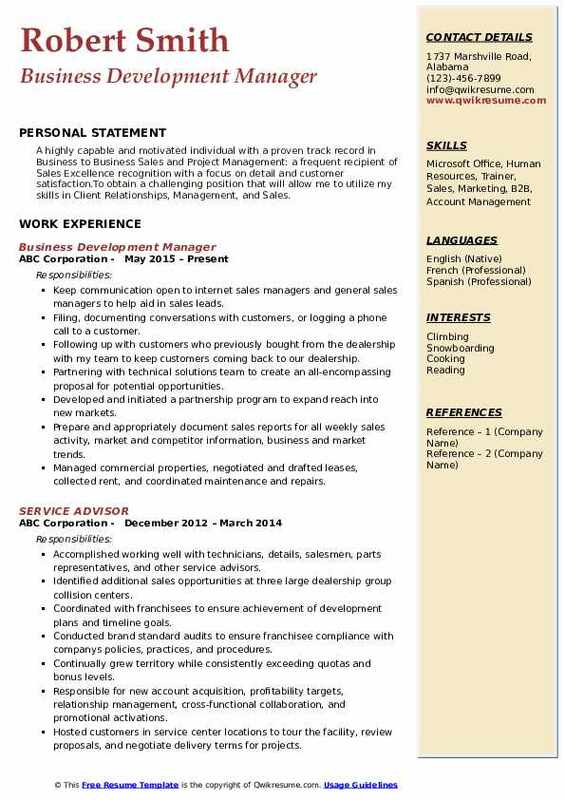 Headline : A highly capable and motivated individual with a proven track record in Business to Business Sales and Project Management: a frequent recipient of Sales Excellence recognition with a focus on detail and customer satisfaction.To obtain a challenging position that will allow me to utilize my skills in Client Relationships, Management, and Sales. Keep communication open to internet sales managers and general sales managers to help aid in sales leads. Filing, documenting conversations with customers, or logging a phone call to a customer. Following up with customers who previously bought from the dealership with my team to keep customers coming back to our dealership. Partnering with technical solutions team to create an all-encompassing proposal for potential opportunities. Developed and initiated a partnership program to expand reach into new markets. Prepare and appropriately document sales reports for all weekly sales activity, market and competitor information, business and market trends. Managed commercial properties, negotiated and drafted leases, collected rent, and coordinated maintenance and repairs. Conducted detailed market analysis studies to work with three large customers to identify additional markets to expand the usiness. 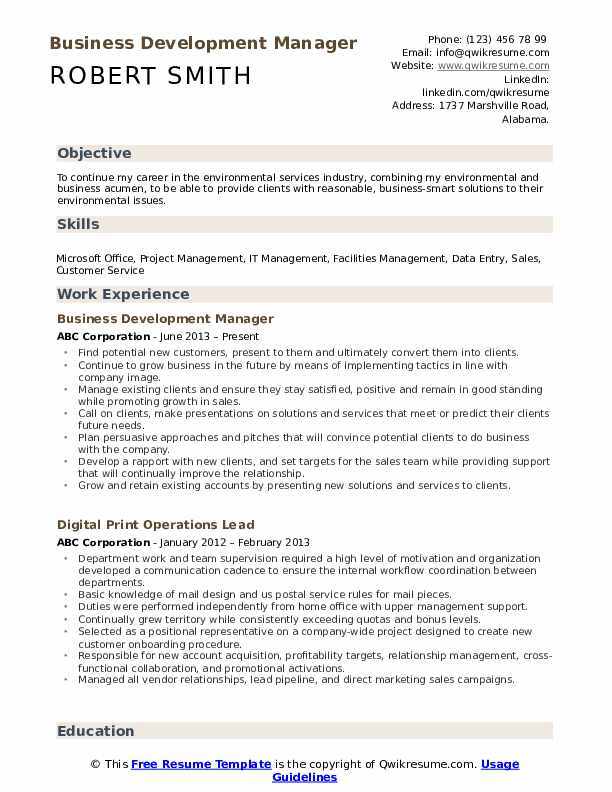 Headline : Accomplished business professional with over 5 years of business management experience. Areas of expertise include, project management, and customer relationship management Exceptional communication and interpersonal skill leading to building extraordinary and lasting business relationships with clients. 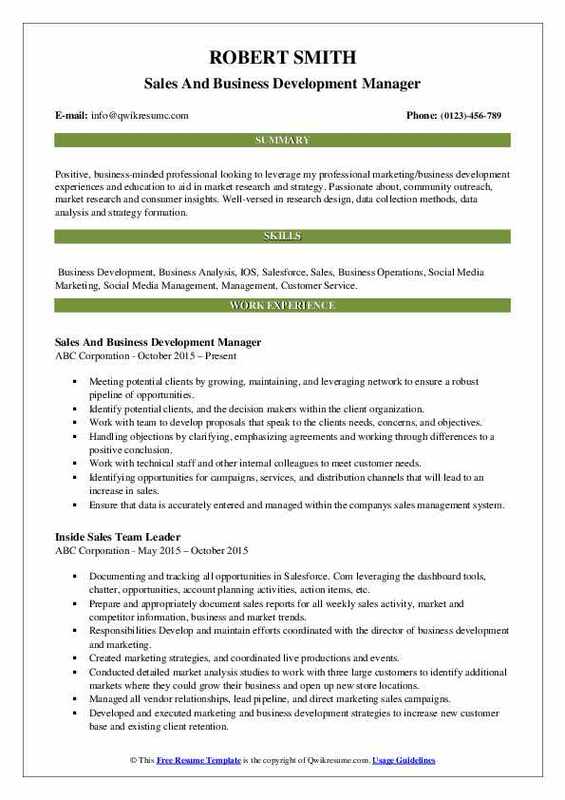 Worked cross-functionally with senior management, sales, marketing, and product management to generate marketing campaigns, speaking opportunities, and sales leads. Adjusted partnerships to align with overall company goals through an annual state of the union meetings with partners. Presented across the country at conferences, in office conference rooms, and one-on-one over lunch or on the phone. Promoted four diverse software and web-based products across three industries: banking, insurance and investor relations. Identified key markets in big data, advertising, e-commerce, cms platforms, and CDN solutions lead clients through the entire sales process from the initial inquiry, pricing proposals, business term negotiations, and close. Directly managed the day-to-day tactical and long-term strategic activities within the business. 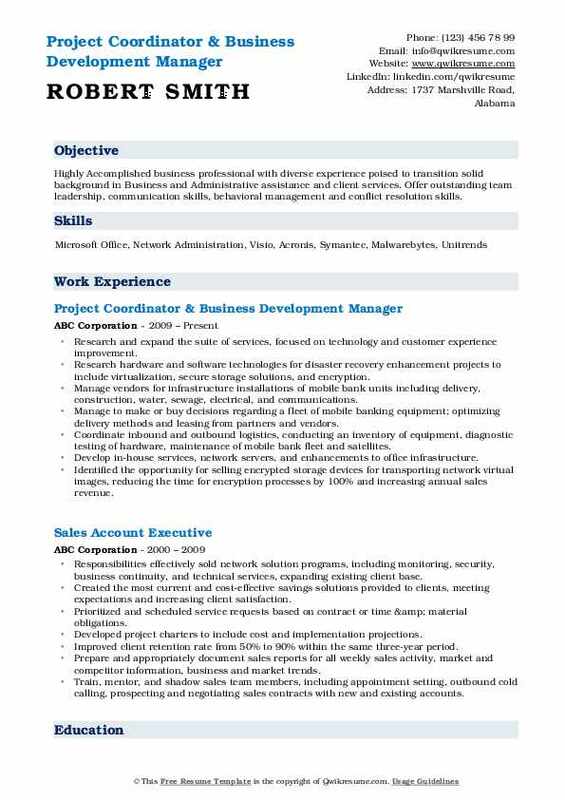 Summary : Hands-on sales and business development professional, effective client relationship manager. Strong focus on consultative sales approach to understanding and solving customer needs. Successfully directed multimillion dollars in sales of professional services, as well as communications and leadership development products for individual and organizational development. Strong belief in team success based on an environment that fosters respect and team accountability. Working with excel to track all revenue potential, revenue delivered, and other forecasting activities. Effectively utilize cosmos to develop bids and proposals, strategize with inside staff and analyze sales activities for the week. Develop partnership relationships between a and b opportunities, building profiles of organizational structure and key contacts. Solicit opportunities to speak before professional organizations and business groups. Develop and maintain processes with the insurance department to ensure the quality length of stay and maximize revenue. Conduct presentations with judges, attorneys, probation and parole departments, department of human services, shelters, hospitals and other drug treatment facilities with clients. 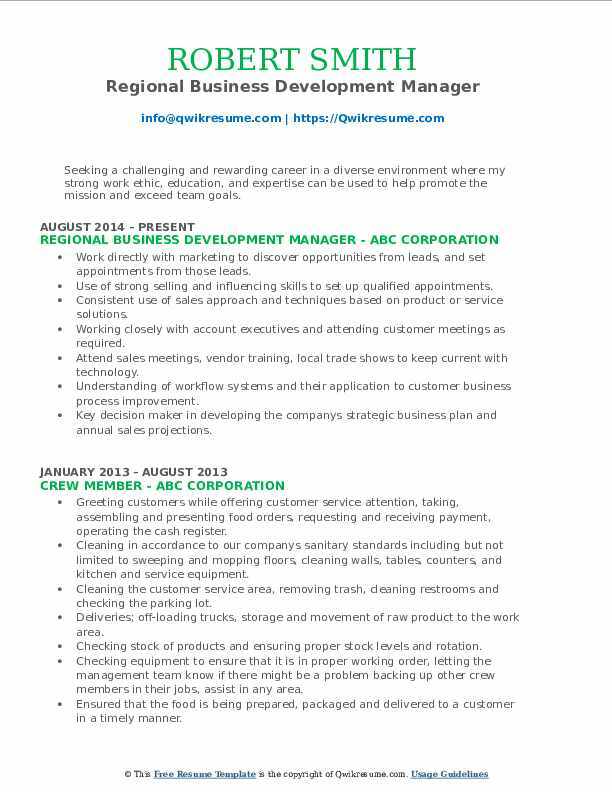 Develop and maintain efforts coordinated with the director of business development and marketing.